As a globally leading tech group specializing in security and mobility, Rheinmetall stands shoulder-to-shoulder with armed forces and law enforcement agencies around the world, serving as a reliable partner – a fact borne out by the Group’s presence at the Land Forces 2016 in Adelaide. Rheinmetall has underscored its commitment to Australian Industry with the participation of four local companies on the group’s stand at Land Forces 2016. These are Adelaide-based Supashock; Melbourne-based Tectonica Australia; Melbourne-based Thomas Warburton; and Sydney-based Axalta Coating Systems. 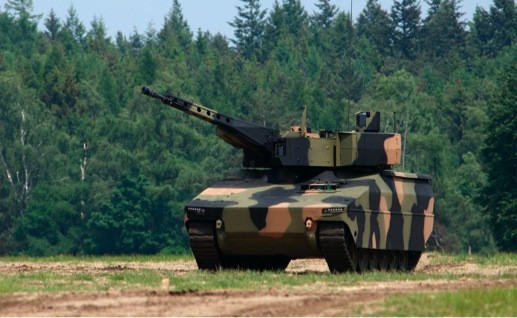 The Australian Defence Force already places its trust in Rheinmetall’s wide-ranging expertise. Procured under the Land121 Phase 3B programme, the country’s new fleet of logistic vehicles is the most prominent example. It is based on the tried-and-tested HX family made by Rheinmetall MAN Military Vehicles, already in service around the globe. Rheinmetall transferred the first 12 trucks to Australia in April. Ultimately, over 2,500 vehicles in multiple configurations will form the logistic backbone of the Australian military. At Land Forces 2016, the FTTD variant of the HX is on display at the Capability, Acquisition, Sustainment Group (CASG) stand, the procurement arm of the Australian Department of Defence. 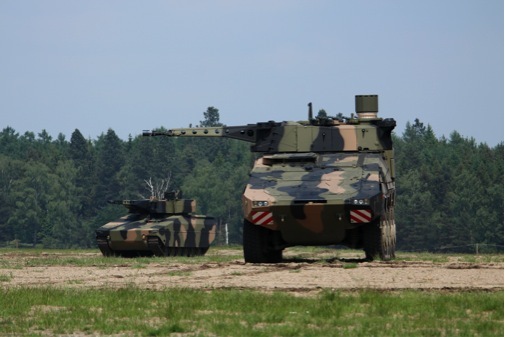 The Australian military’s LAND 400 Phase 2 - Mounted Combat Reconnaissance Capability project provides Rheinmetall with another opportunity to demonstrate its systems engineering prowess and extensive experience in international projects. The combat reconnaissance vehicle (CRV) version of the Boxer multirole wheeled armoured vehicle has been selected as one of only two remaining competitors to undergo field trials known as Risk Mitigation Activities, or RMA. The Boxer CRV is the latest configuration of the 8x8 wheeled armoured vehicle, developed and manufactured by a major industrial consortium. It features a Rheinmetall-made LANCE turret armed with a 35mm automatic cannon, coupled with command and reconnaissance architecture (C4ISR) from Northrop Grumman. In addition, visitors to Land Forces 2016 can learn about Rheinmetall’s exceptional expertise in the field of infantry fighting vehicles. In a joint venture with Krauss Maffei-Wegmann, Rheinmetall developed the new Puma infantry fighting vehicle for the German Bundeswehr. The new mainstay of Germany’s mechanized infantry is a masterful combination of mobility, survivability, situational awareness, manoeuvrability and – by no means least – state-of-the-art lethality. The Puma marks the dawn of a new era in mechanized warfare. A model of this state-of-the-art platform is on view at the Rheinmetall stand. At Eurosatory 2016 in June in Paris, Rheinmetall unveiled its new Lynx armoured fighting vehicle. Combining massive firepower and excellent protection, this agile tracked vehicle is destined to dominate the modern battlefield, lending itself to operations ranging from peace enforcement to high-intensity combat. The Lynx comes in two different versions: the KF31 and KF41 (KF stands for Kettenfahrzeug, which means ‘tracked vehicle’). The Lynx KF31 infantry fighting vehicle weighs up to 38 tonnes and can carry 3+6 soldiers. The Lynx KF41 is a bit larger and has space for 3+8 soldiers. Both versions – the Lynx 31 and Lynx 41 – can be configured for a variety of missions: besides the basic IFV, command & control, reconnaissance, repair & recovery, and medevac variants are available. At Land Forces 2016, Rheinmetall is also showcasing its comprehensive expertise in the fields of force protection, air defence, weapon systems and ammunition. Here the portfolio ranges from pyrotechnic signal flares to high-energy lasers. The focus this time is on infantry ammunition; automatic cannon such as the Puma’s airburst-capable MK30-2 ABM and the highly effective MK2 Millenium air defence gun; the Leopard 2 tank’s globally acclaimed 120mm smoothbore gun; a new family of mortar ammunition; and artillery shells and propelling charges. Rheinmetall is currently working on a number of other forward-looking technologies. On the one hand, plans are afoot to enhance the performance of the 120mm tank gun. But the Group is also pressing ahead with concepts for future combat vehicles featuring 130mm main armament. High-energy laser (HEL) effectors are another prime example of Rheinmetall’s technological leadership; these have already been successfully tested on land and maritime platforms. Headquartered in Düsseldorf, Germany, Rheinmetall AG is a publicly traded high-tech Group specializing in advanced security and mobility solutions. For many decades, Rheinmetall’s Defence arm has served the world’s armed forces as a reliable partner. Organized in three divisions – Vehicle Systems, Electronic Solutions, and Weapon and Ammunition – Rheinmetall, one of Europe’s foremost makers of military systems and equipment, supplies armies, navies and air forces around the world with the wherewithal for successful outcomes. Rheinmetall Defence never stops setting new technological standards: from tactical vehicles, force protection technology and weapon systems to infantry equipment and air defence assets, right through to networking solutions for target engagement sequences, electro-optical sensors and simulation applications. High-tech products for protecting the people who protect us: this is the true mission of Rheinmetall Defence.